This week Crime Stoppers of Mesa County needs your help in locating a theft suspect. On Sunday, November 9th the Grand Junction Police Department responded to a theft call at Chuck E Cheese restaurant located at 2424 Hwy 6 & 50. Sometime between 3 p.m. and 5 p.m. the victim’s iPhone 6 was taken from a table inside the restaurant. Surveillance video shows an unidentified male took the iPhone. The total estimated value is more than $600. 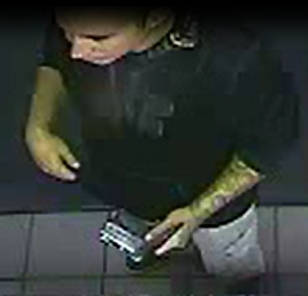 The surveillance photo of the male suspect is included in this post. If you know the identity or location of the subjects involved in this crime, please contact Crime Stoppers at 241-7867. Information reported to Crime Stoppers that leads to an arrest can earn you up to $1,000 cash reward and you will remain completely anonymous. For more information, see us at www.241stop.com.